Diverse company of dancers, actors, and musicians of various ages and training. Terrance Duncan, Deborah Li, Mari Mori, Lea Kramberg, Chi-Tsung Kuo in Nisei. Photo by Jonathan Fazio. BOTTOM LINE: A heartfelt 2001 ballet from a Brooklyn ballet company finds its way into the Fringe spotlight. The Covenant Ballet Theatre of Brooklyn is showcasing a strong sense of community at this year's NYC Fringe Festival. 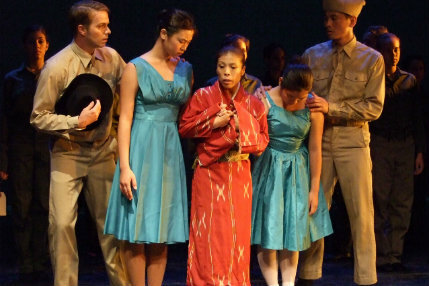 The 2001 ballet, Nisei, is about the vitality of a community of Japanese Americans overcoming the bigotry against them during WWII. It has been re-imagined for the company's repertoire and this year's Fringe. Furthermore, the Covenant Ballet is a strong community ballet company and academy in Brooklyn that has only recently overcome a financial and structural blow to the company's home in the Gravesend community of Brooklyn. The resilience of the company, led by Marla A. Hirokawa, is evident by the sold out run at this year's Fringe. The ballet tells the story of an older Nisei (a second-generation Japanese American) recalling his years as a young soldier in WWII. The Old Nisei (played beautifully by Lawrence Lam) teaches his grandson (Sebastian Huynh) about the war while the stage is flooded with his memories. This includes one of Hirokawa's most riveting scenes where the attack on Pearl Harbor is announced at a radio party at the Nisei's home. The party guests quickly abandon the Japanese American family treating them like criminals. The Nisei fights against the bigotry through patriotism by becoming a soldier. He finds he is marginalized there as well. He is segregated from his fellow troops and not allowed to bear arms. Eventually the Nisei does fight on the front lines heroically. Hirokawa's ballet ends at a Veterans Day Parade where vets of all races, including the Nisei, are honored by young scouts. Nisei is a mix of trained professional ballet dancers, including the impressive company principle Tanya Trombly. The rest of the company is made up of actors with a strong sense of movement and children who are a part of Covenant's ballet academy. The original music is played live by an onstage band led by musical director Craig Brann. The piece is primarily effective in the communication between multiple generations through dance, and as an education for young people on the bigotry shown to Japanese Americans in WWII through segregation and internment camps. The community and families involved with the production deserve all of the pride they have in seeing this passionate group of artists, young and old, take the stage. The capacity for high-level ballet technique falls short, but is overcome by the more important heart of the piece. Hirokawa saves the most effective reveal for the end of the performance when she brings onstage three real-life veterans to be honored. The ballet is dedicated to them, especially the final guest who is a Japanese American man who actually fought in WWII. She takes the time to talk about these men after the curtain call and the story behind the ballet. It will certainly resonate for years to come for these young performers, their community, and those in the audience.